The question upon which this story revolves is whether an unrepentant soul who dies unexpectedly and in mortal sin can be redeemed and accepted into Heaven. Durkee unfolds the story brilliantly, starting with the death of the main character, Samuel. Samuel hasn't focused his life on bringing glory to God. In fact, he hasn't thought about God much at all. When, upon his death, an angel appears to guide him through the death experience, Samuel is reluctant to accept his help. He is equally unimpressed by the angel's explanation that he isn't going to make it into Heaven. "Why not?" asks Samuel. "The Bible says that all I have to do is believe in God and I do, so I should be allowed in." 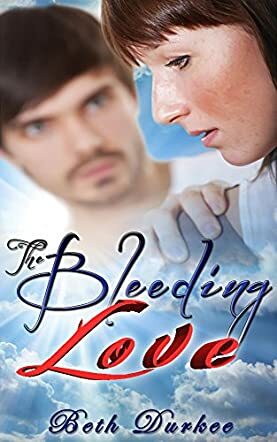 The Bleeding Love reminds us not only of God's promise to us upon our deaths but also warns us of His expectations for our life here on Earth. This book was a wonderful read. The story presented here was very thought-provoking, and I talked about it for hours with my husband after reading it. You've got to love that in a book, when it stimulates you enough to make you ponder things. It's hard for me to believe that this story was so coherent and similar in tone after reading the author's preface indicating that this story was an experiment whereby different people input their ideas into story and character development. Good job, Beth Durkee!